At last it really feels like spring is here. 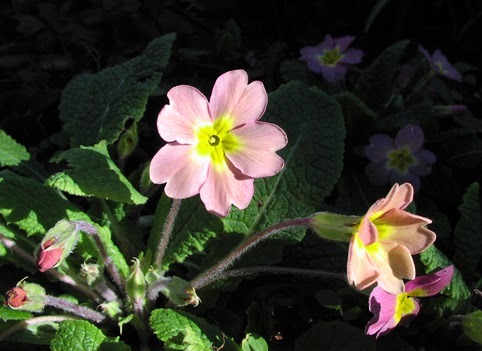 Yesterday, it was warm and bright and I photographed these little primroses in a sunbeam in my garden. According to folklore, if red blooms and blue primroses grow outside your house they will attract fairies and offer magical protection to those who dwell inside. I know I have pink and yellow flowers - I'll have to look out for blue ones. I've not heard that about Primroses and fairies before, I love finding folklore out about plants. Plant folklore is fascinating, I agree.